OK, so I was trying to save my Pinspirations for the end of each week, but I was pretty excited about this one, so I'm doing this one a bit early. OK, really early. Let's start with the Pinspiration. I originally found this image on Pinterest, but I tracked down the original image to be from here. This is Caitlin from A Little Dash of Darling, who I've now added to my blog list because she's pretty fabulous. I mean honestly, what's not to like about this? Kind of like when Joey on Friends eats the Trifle and says, "Custard, good. Jam, good. Meat, gooood." 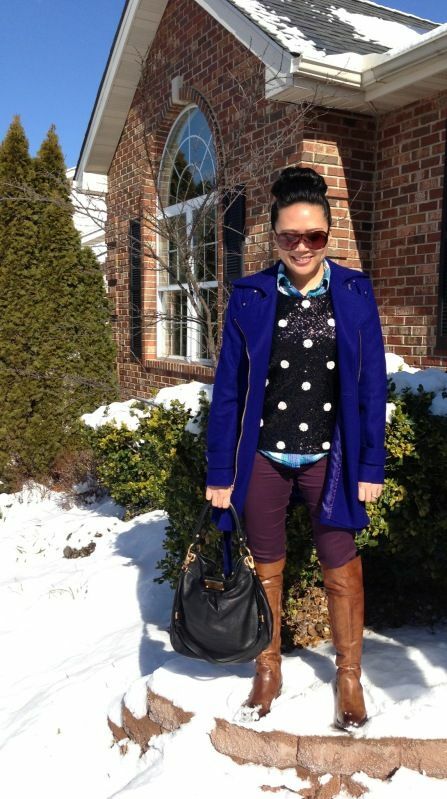 The outfit has a little bit of everything I love - polka dots, plaid, color, cognac. I would have never mixed everything together like this, but it all works on her very well. When I first saw this - I pinned it immediately because I actually had all of the pieces to make this. I have this thing about repeating outfits at work. A) I have so many clothes, I need to give everyone their turn and B) Other than pants or jeans or other basics, I try not to wear anything around the same audience until I can't remember the last time I wore it myself. Not that I judge anyone who does do this, I don't even notice to be honest, but it's just a personal quirk of mine. So my point to this story is, I've been wearing my wine skinnies a lot to work, and I just recently wore my polka dotted top to work as well. Therefore, I had to find a place to wear this outside of work, and while it was still coat weather. Given that I don't go out much, I took today as my opportunity. This was for Sunday lunch with a friend. Yes, I had to assume a similar pose in that first pic for full effect. Like I said, I would have never thought to put this together myself, but I really love it. I love the saturation of color in the coat. It picks up the blue in my plaid shirt. There are only hints of plaid peeking out behind the polka dots, so I think this pattern mixing works well. And then each color pairs well with both wine and cognac. The black is enough to keep everything grounded, but the sequins add flare. Did I mention the studs on the back of my boots? Yeah, okay, there's a lot going on, but don't judge! It all makes me happy. i would NEVER think of putting that together but it is soooo cute! i have the burgundy skinnies and i NEVER wear them because i am too color retarded to match them with anything. never would have thought they'd go with blue, plaid, AND polkadot. ahhhh! my mind is blown. Haha! Yes this is definitely quite a combo but I love it! It's so fun!